This long Labor Day weekend seemed like it couldn't get here fast enough. I love Labor Day because it's my birthday weekend, and growing up in Northeast Ohio, it also meant lots of Fall shopping. Fast forward to today and living in the South, there is still shopping involved over this weekend, but now I'm taking advantage of Summer sales instead of stocking up on cozy Fall knits. There are plenty of sales to get excited about this weekend. Here is your neighborhood guide to some of the best sales to help you plan your shopping strategy. Wednesday night, I launched my collection of Nashville neighborhood hats to my email subscribers. I am so excited for this collaboration with Tuck Shop Trading Co. These toque hats are soft and slouchy and they're going to keep our heads warm this winter. I love the tan and navy Nashville toques so much, I can't decide which one is my favorite. More neighborhoods are coming very soon, but Five Points, The Nations, WEHO and 12 South, along with the Nashville hats are ready for purchase now. Click here to shop! You only have until Tuesday, September 6 to vote for your favorite locally owned businesses in the Nashville Scene's annual Best of Nashville Readers' Poll. You all have been nice enough to vote Stella Shops one of the Best Fashion/Style blogs in Nashville for the past five years. I'd really appreciate your vote again this year. You can vote here! Thank you so much!! Margaret Ellis - You don't need another reason to drool over Margaret Ellis jewelry, (this collection is so so good! ), now you have a reason to shop. September 6-9, spend and save. Any Old Iron - My friends at Any Old Iron have taken some pretty amazing trips recently. This Saturday only around 100 of their gorgeous Japanese vintage dresses will be 50% off. There will be a rack of new arrivals to shop too. The sale is on from 11am-7pm. You never know what little gems you'll find here so make sure this sale is at the top of your list. DCXV - This weekend shop DCXV's summer sale. All tanks & shirts start as low as $10. Non-apparel is 25% off and there are some other killer deals too. Sundays at Porter East - It's the first Sunday of the month and that means the shops at Porter East are having a party. There are some gems in this little strip, and most of them are having summer sales, so add this to your shopping stops on Sunday. Read more about my favorite Porter East shops in my last 12th & Broad Broad Style. Abednego - This is one of my favorite new shops in Germantown. Don't miss their Summer Sale this weekend. Wilder - Wilder does a fantastic job of bringing some really unique brands to Nashville. Save the date for the launch of their Men's Popup, called "Otherness" on September 10. Don't miss the kick off party from 6-9pm that will have some surprise performances and an exclusive giveaway. The popup will also be available to shop online in case you're not in Nashville. Elaine Turner - Get a double deal at Elaine Turner this weekend. 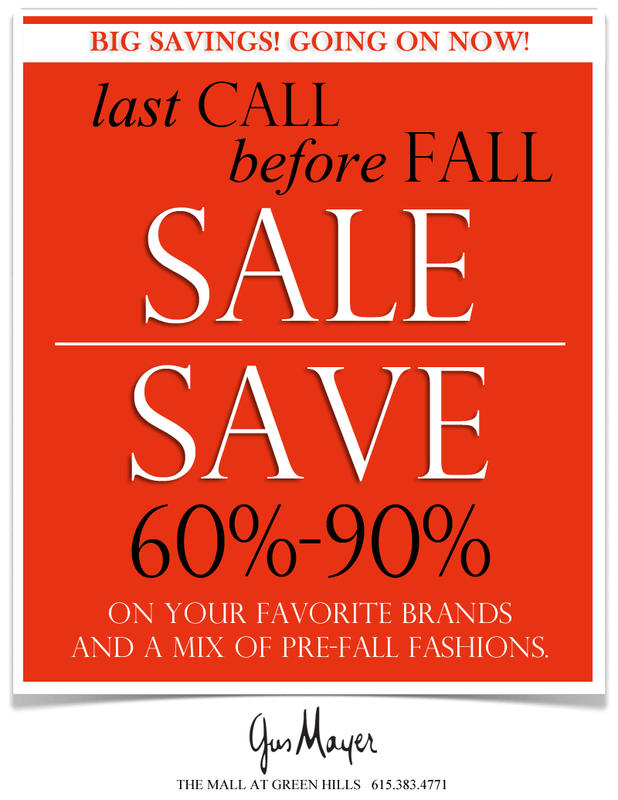 Take an extra 30% off summer sale items and take 20% off fall. Gus Mayer - Now is the time to take advantage of these final sale days at Gus Mayer. At 60%-90% off, you are bound to find something fabulously designer at an incredible price. Woo Skincare & Cosmetics - I love Tata Harper skincare products. They're 100% natural and nontoxic, and my skin always looks and feels better when I use them. Save the date for the Tata Harper event next Friday and Saturday. Book your appointment now so you can receive a complimentary facial from a Tata Harper trainer and received a free gift with purchase. Happy Shopping and have a wonderful Labor Day weekend!